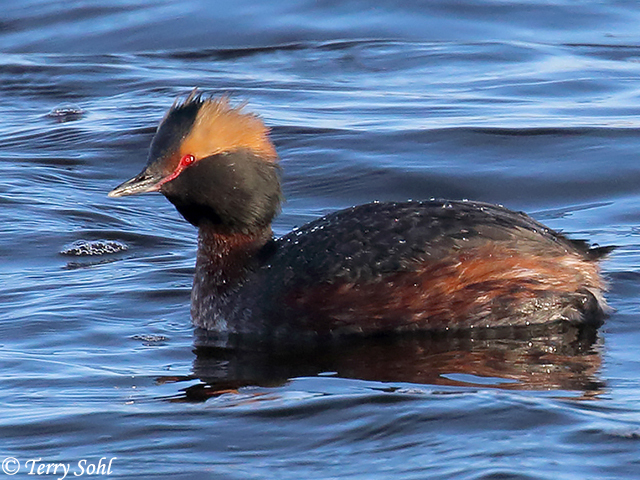 Horned Grebes are a widespread grebe, also found in Europe and Asia. They are often relatively tame, allowing fairly close approach by humans. Horned Grebes are not as gregarious as many of the grebes, and don't breed in the large colonies that other grebes sometimes do. The Horned Grebe is similar to the Eared Grebe, but can best be differentiated in summer plumage by the reddish neck (the Eared Grebe has a blackish neck). Habitat: Lakes, ponds, reservoirs. Prefers areas having both open water and wetland vegetation. Diet: Mostly insects and crustaceans during summers in South Dakota, also fish, amphibians, leeches, and some plant material. Behavior: Primarily feeds by diving under the water's surface and propelling itself through the water with its feet. They will also pluck food items from the water's surface. 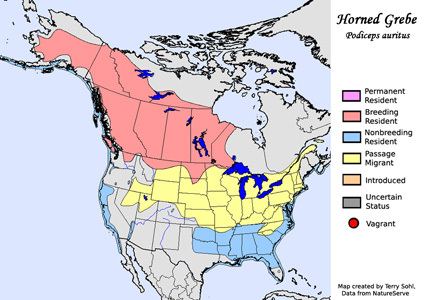 Migration: Summers in extreme northern U.S. the western 2/3rds of Canada, and Alaska. Generally winters along North American coastlines and large inland water bodies in the south. Status: Possibly in long-term decline. Additional Photos: Click on the image chips or text links below for additional, higher-resolution Horned Grebe photos. South Dakota Status: Uncommon migrant throughout the state. Uncommon summer breeding resident in the north-central and northeastern part of the state.